It's a new "QRP in the Park" season and I have a new rig. I need a new QSL card. My new card, using Walmart digital photo printing and 3.3"x4" Avery shipping la bels, costs about $.30 each in single quantities. This is a great match for my operating style. Rarely do I get on the air and work 100s (or even 10s) of hams in a short time. It would take me forever to work through 100 or more pre-printed QSL cards. This way I can make up QSL cards 5-10 at a time and easily update them without throwing out a bunch of unused cards. Interested in doing the same? See my January 2, 2010 blog entry. Today the weather finally turned warm, sunny and dry. It was also Mother's Day, a good reason to avoid the restaurants for a picnic in the park. I did get a chance, though, before the picnic to practice my favorite operating pastime. I found several signals on 20 mtr CW. 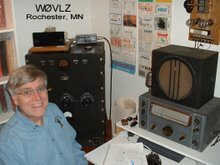 Gary, K5ON, answered my CQ. We had a great QSO. The KX3 again performed great....love that roofing filter.